Home » Archive » SP-104. Spanish-American War Era US Army Medical Corporal Chevrons with Collar Insignia. SP-104. Spanish-American War Era US Army Medical Corporal Chevrons with Collar Insignia. A pair of wool multi piece construction chevrons, same size and style but color slightly mismatched. One is VG+; the other has a large section missing from along the edge. 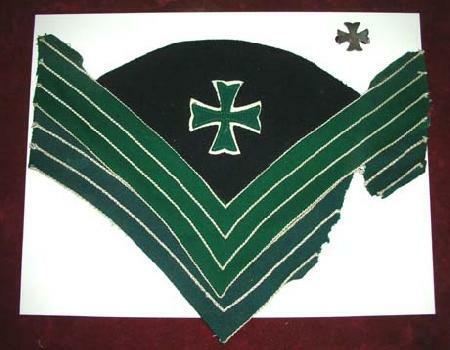 Collar insignia is also VG and may be the M1902 style. Set of 3 items.